Ask a person of Lower Assam about his next holiday destination, he’d perhaps name a place of Bhutan. And ask the college students of Lower Assam about their picnic place, they would instantly reply Indo-Bhutan border areas have been their every year’s picnic spot. Then, what attracts the Indians towards Bhutan? Is it happiness, the doctrine that guides the Government of Bhutan? Remarkably, the attraction is both ways. It is not a wonder for any Assamese to see the Bhutanese in their town/village on daily basis. Dignitaries from India and Bhutan taking part at the Mela. Probably it is the reason why the people of both sides bother less about the question why they are magnate to each other. The easy cross-border trade and pass free accessibility from both nations often put the people in oblivion about the political difference they might have! It won’t be an exaggeration if we say the bond between India (Assam in particular) and Bhutan is perennial. Probably no Assamese have spent a winter without seeing the makeshift Bhutia markets of warm clothes in various parts of Assam. Yes, ‘Bhutia’ is the lovely name they are popularly known as in this region. It is a name that is enough to invoke in the Indian love and reverence for those well-mannered traders from the world’s happiest country. Particularly, the cheerful faces of the lady stall-owners with a polite request ‘bahanji ye accha hai, le lijiye’ (Sister, it’s of good quality, please take it) to buy their products would definitely compel the buyers to purchase a piece from them. The bond that usually grew between India and Bhutan has culminated in different fiestas from time to time. The Indo-Bhutan Friendship Fair is one such carnival. 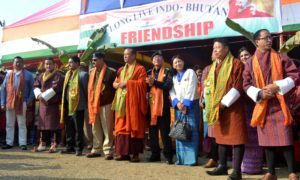 Initiated by Indo-Bhutan Friendship Association in 2011, it is organized to boost the bilateral relationship between these two neighboring counties. The fair is held at Subankhata in Baksa district of Assam in January for a week or more. In this week-long fair, Subankhata turns into a meeting ground for hosts of traders from the countries, sellers of local cuisines, artists, celebrities, and visitors across the country and beyond. As the fair aims at galvanizing the bond of fraternity between the Indian and the Bhutanese, the inauguration of the main archway has been an important event of the occasion which the delegates from both the nations take part in. Apart from it, the lighting of the ceremonial lamp at Magh Mela temple, hoisting the national flags of India and Bhutan, the release of parachute balloons, and the inauguration of the main pandal, craft bazaar, expo stalls, photo exhibition, and banijya mela constitute the key events of the inaugural programme. A festival held in a culturally affluent state like Assam would be incomplete without a room for cultural items. 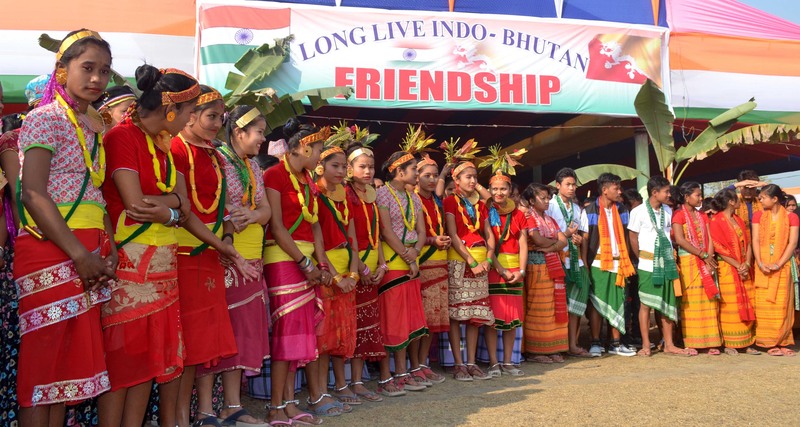 The Indo-Bhutan Friendship Fair endorses this fact by showcasing many colorful programmes like dhuliya bhaona, songs, and dance forms like Bihu, Kherai, Saraniya-Kachari, Rabha, Jhumur, Nepalese, and Bhutanese etc. Songs and dance programmes include both shows and competitions in solo and group categories. Being there and watching the programmes the viewers just cannot but get enchanted, excited, and joyful. It seems as if the liveliness of the performers has permeated in them. Again, the rows of food cuisines— Indian and Bhutanese— are another attraction of this fair. Curiosity to taste the foods of others and the stepping out of the familiar food-habits has been found to be the common tendency among the visitors. Amidst all these exquisiteness of the cultural events that the multiple ethnicities from both the nations display, welcoming trading, and variety of delightful ethnic food-stuffs and many more, the tourists seem to forget where they have come from. They just get lost in an overwhelming feeling of togetherness. Probably it is the spirit that this festival wants to arouse in every visitor. Yes, it is a festival of boosting ‘friendship’! This fair could be said to be a face-lift of its earlier version ‘Subankhata Magh Mela’ which was first organized 66 years ago with an aim to build a welcoming bond between India and Bhutan. Later the effort of Indo-Bhutan Friendship Association coupled with the necessary actions of the governments of both the nations has given the festival the present glorious form. Thus the ongoing fair is the 8th edition (and the 66th edition of Subankhata Magh Mela) that kicked off on 17th January. Nothing seems to work better than the spirit of sharing when it comes to making friends on all fronts— trade, politics and so on. Sharing lingers when it is coupled with excitement, awe, and joy. All these good feelings flow as we share our best possessions which make what we are. Again, we need some channels too. Here our culture comes as the messenger. Indo-Bhutan Friendship Mela has been a fair on building a bond between two neighbouring nations in all facades through the channel of cultural exchange. Ramala Sarma is an Assistant Professor at Nowgong College, Nagaon. She can be reached at ramalasarma@gmail.com.